Are you a musician, visual artist, dancer, actor, filmmaker or other artist living in the Chicago area? If you answered YES to both questions, we invite you to participate in a focus group on Wednesday, Feb 29 about artists and health insurance. The meeting will be 90 minutes long and held at a Metro-accessible location in the Chicago area. Email artistfocusgroup [at] reingold [dot] com (subject: Chicago%20focus%20group) or call 202-333-0400 and ask for Jillian to find out how you can get involved! Please share widely with your artist friends. 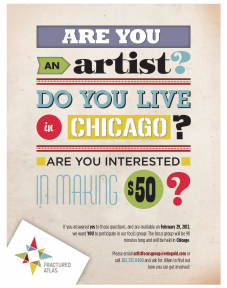 We want to hear from a diverse range of Chicago area artists. Submitted by Elizabeth Gelman (not verified) on February 28, 2012 - 1:12pm.